On Saturday, October 21, 2017, from 9:00-3:00, the Vanderbilt University Writing Studio is proud to host Tutor Collaboration Day 2017, sponsored by the Southeastern Writing Center Association. Writing Center tutors, staff, and administrators will come to join with their peers to share knowledge and join in collaborative discussions about the theory, practical applications, challenges, and opportunities of tutoring students at all levels (K-12, undergraduate, and graduate) in writing. The schedule for this year’s event is now available on this page. Just scroll down! 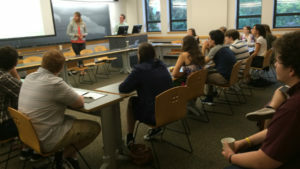 Tutor Collaboration Day will be held at the Vanderbilt Writing Studio in the Collaborative Learning Suite (1801 Edgehill Ave., Suite 112), Vanderbilt University. We will be in the same building that houses the Curb Center and the John Seigenthaler (“First Amendment”) Center. Event Parking: Our designated parking lot for Tutor Collaboration Day is Vanderbilt Parking Lot 82, which right across the intersection of Edgehill Ave. and 18th Ave. from where the event will be held. Click here to access Vanderbilt’s interactive campus map. Deadline for topic proposals: EXTENDED through Friday, October 13! Proposals can be submitted through this GoogleForm. We invite suggestions for 45-minute, discussion-oriented break-out sessions on topics relating to writing centers that you, as a tutor, are willing to help moderate. The expectation for Tutor Collaboration Day is that tutor facilitators will lead an informed discussion, not read a full paper or presentation, but these discussions have formed the basis of eventual formal presentations at the annual SWCA conference in the past. 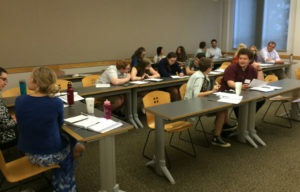 This year’s Tutor Collaboration Day theme is “Writing Centers in Transition,” mirroring the theme of the 2018 SWCA Conference, and the Call for Papers for that conference might be a source of inspiration for Tutor Collaboration Day proposals. For additional inspiration, you can peruse last year’s Tutor Collaboration Day program and an archive of two past TuColla events. Thank you for taking a moment to register and helping us know how many participants to plan for (especially in terms of our lunch order). All locations listed are within the building that houses the Writing Studio at 1801 Edgehill Ave. Questions? Please contact John Bradley (john.bradley@vanderbilt.edu).